Secretary-General Ban Ki-moon at the Peace Bell Ceremony on the occasion of the International Day of Peace 2014. With John Lennon's iconic song “Imagine” as the backdrop, the United Nations today marked the International Day of Peace underscoring that all people have the right to peace. With John Lennon’s iconic song “Imagine” as the backdrop, the United Nations today marked the International Day of Peace underscoring that all people have the right to peace. “We must douse the fires of extremism and tackle the root causes of conflict,” Secretary-General Ban Ki-moon said ahead of the official observance of the Day, 21 September, which this year falls on Sunday. As on each year since the Day was created in 1981, the Secretary-General asked combatants to lay down their arms “so all can breathe the air of peace.” He also called on people around the world to observe a minute of silence at noon and reflect on what peace means for the human family. Among the highlights of this year’s events, Yoko Ono contributed John Lennon’s song “Imagine,” which was originally released by the former Beatle in 1971. While Mr. Lennon’s lyrics “imagine all the people living life in peace” have not come true, Ms. Ono said she believes the world is moving in the right direction. In a world of turbulence and conflict, she advocated for people to change their own perceptions before trying to change the world. “Surrender to peace, think peace, act peace and spread peace, and imagine peace,” she summed. The theme of this year’s International Day of Peace is “Right of Peoples to Peace” in honour of the 30th anniversary of the General Assembly Declaration on the Right of Peoples to Peace. Throughout this coming year, the UN will also commemorate its 70th anniversary and reaffirm a commitment to the Organization’s purposes and principles, and its central message that humanity’s sustainable progress and the realization of fundamental rights and freedoms depend on peace and security. The Peace Bell is a gift from Japan that hangs from a wooden beam in the rose garden in front of UN Headquarters. 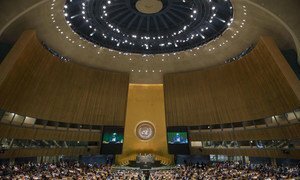 It has tolled every year since 1981, when the UN General Assembly established the Day to coincide with the opening of its annual session in September. Mr. Ban was joined in at the ringing ceremony by UN Messengers of Peace Jane Goodall, Midori and Yo-Yo Ma – who will both perform on the Day – and UN “Girl Up” Champion Monique Coleman. The perimeter of the garden was dotted by some 500 high school and university students, many holding flags of the Organization and all 193 UN Member States. Following the ceremony, the students and the celebrities retreated inside to discuss this year’s theme via video conference with youth from Bukavu, Goma and Kinshasa, at the UN Organization Stabilization Mission in the Democratic Republic of the Congo (MONUSCO). This year’s commemoration also highlights the Human Rights up Front approach, which emphasizes the need for early action, the crucial role of responding early to human rights violations, and the importance of preventive efforts in the protection of civilians. It includes training UN staff on the world body’s core purpose of promoting respect for human rights and ensuring that UN personnel around the world are more attuned to situations where there is a risk of serious human rights abuses. “Armed conflict causes untold grief to families, communities and entire countries,” Mr. Ban said in his message for the Day. In his message for the Day, the President of the General Assembly, Sam Kutesa, noted that today is a reminder of the lives lost through war, property destroyed, families and communities torn apart and development efforts disrupted. “We should recommit our efforts towards the peaceful resolution of conflicts and the building of lasting peace,” he underscored. Among other events marking the Day, the UN will announce the results of “The Little Prince” essay and drawing competition. It was organized in partnership with the UN Department of Public Information (DPI), the International Organization of la Francophonie, and the Estate of Antoine de Saint-Exupéry. Also present in the student observance will be Verma Mukoro, from Kenya, winner of the My MasterPeace Moment story-telling competition. In addition to “Imagine,” the soundtrack for the Day’s events will include performances by Midori and Yo-Yo Ma. A number of other concerts will take place around the world on the Day itself. Akon headlines the Peace One Day Celebration 2014 in Goma, supported by MONUSCO. Meanwhile, MasterPeace is organizing some sixty concerts in 40 countries, including seven flagship concerts. The concert for peace, organized by UN Stabilization Mission in Haiti (MINUSTAH) as part of its community violence reduction campaign Ann Chwazi Lapè (Let’s choose peace, in Creole), will be held on 27 September. The United Nations General Assembly opened its 69th annual session today with the body's new President declaring that it would be a historic opportunity to formulate a post-2015 development agenda that is transformative, brings tangible results in fighting poverty, and leads to improving lives of all people.